The (Hopefully) Guff-Free Reason Why you should vote Yes. Yes, because above all else, we need to be in the room. Jobs. Inward Investment. Influence within the institutions of…..bleugh. You’ll have heard all that stuff from people smarter than me. Here’s why I’m voting Yes. The EU works. It does more good than harm, and I’ve not come across a proposal from Sinn Fein or Joe Higgins or UKIP or Coir/Youth Defence which makes better sense, and wins as much support, as the EU. We’re not voting on the EU, you cry. We’ll still be in the EU regardless of how we vote. If we vote No, the rest of Europe will respect our decision. They will accept that we have voted twice against further integration, and that we are sincere in our beliefs that this is as far as we go. In short they will, much to our surprise, actually believe us. A) We have said (Three out of four times.) that we’re not interested. B) Why would anyone negotiate with an Irish government that can’t get any agreement it makes ratified through a referendum anyway, after failing twice in a row? There is good stuff in the treaty, but it is technical. The Council will vote in public, for example. Does that excite you? Does that cause your nether regions to stir? Is there anyone closing their curtains, and sweatily slipping “Red Hot Council Decisions Volume 2.” into their DVD player? No there isn’t. But then there are no teenagers slipping a well thumbed copy of “Aircraft Window Sealant regulations” under the sheets either, but next time you get on a plane, and look at the seal around the window, I bet you’ll think: “I hope someone checks this stuff.” Stuff can be boring AND important and this is one of those things. Many of the people opposed to the treaty are sincere. Joe Higgins is, but Joe is also using the treaty to fight for a vision of society that he has never suceeded in doing in a general election. Trying to turn Ireland into North Korea without the psychotic midget dictator and the daily diet of tree bark and weevils is going to be a hard enough sell. At least turn up on the right battlefield , Joe. Sinn Fein are still moving away from a 19th century view of the world towards modern times. There are some who say that Sinn Fein opposed this treaty primarily because they knew they would be the only party who would, and so would get additional publicity. Certainly, when you look at the way Sinn Fein ministers in the North talk about the EU (Quite nicely in a More Tea, Vicar? Chocolate Hobnob? kind of way.) and with the same tone that the PSNI talk about their committment to human rights, you can’t help thinking that they’re either two-faced, with a partionist approach to the EU, or the ministers in the North show the way Sinn Fein is heading on Europe. Either way, their alternative has almost no support in the rest of Europe, and believing that Sinn Fein can make the other 26 countries surrender everything is a bit hopeful: When they tried to negotiate with just one country (The Brits), the best they got were all-Ireland telly ads telling us how to not get the runs from food poisoning. Coir/Youth Defence have it in for, well, 21st Century life on Earth. As one architect friend of mine summed them up: ” According to Coir, voting Yes will mean that the gays can force unborn children to fight in Afghanistan for €1.84 an hour.” How can we listen to people who don’t even identify themselves on their own website? What’s their real agenda, as ide from splitting the lease with Youth Defence? We have problems, big giant Godzilla-without-cute-Godzuki sized problems coming at us. We don’t need to create new problems for the sake of it, and that’s what we will do with a No vote. If you’re pissed off with the government and the political establishment, that’s fine. Kick the crap out of them at election time. But voting No to get at the government is like being one of those morons who throws rocks at the fire brigade. As Iceland discovered, the EU is the fire brigade, and it sure is handy having a direct line to the station. Yes is, quite simply, the sensible self-interested way to go. Posted by Jason O on Sep 29, 2009 in Not quite serious. DCI Barnaby: Would have actually reduced the murder rate if he had stopped investigating. The only comparable spike in the murder rate occurred on the Channel Island of Jersey, where in a period during the 1980s, one in two people on the island were murdered. At one stage the only people on the island not to have been murdered were the police themselves and a rogueish millionaire named Charlie. A regular correspondent, Valvadus, has requested an opportunity to share some opinions on topical issues with you. I don’t endorse them all, but am happy to accomodate. ” Bank Bonuses. We, the gullible, tax-paying (in most cases) public, have always been told that banks had to pay US style salaries, so as to retain bank executives of the highest calibre. That contention has now been entirely disproved, as these “talented” bankers have been shown to be empty suits. However, their primary physical characteristic – a neck of iron – is reappearing, and we will soon see new justifications for seven-figure salaries, commensurate bonuses and cut-price share options. However, there is a simple solution to the question of bank executive remuneration. Banks should be divided into two categories: those that avail of state deposit protection, and those that decline such protection. In any bank that chooses protection, salaries and any bonuses would be limited by statute, and all details published. Any bank that elects not to avail of state protection could pay whatever it likes – as long as it is understood that if it fails it will not be supported in any way by the state, and its depositors and shareholders will lose their entire investment. What I do mean is that Fas is an entirely discredited organisation, and simply putting a new person in charge will not bring about the radical reform that is needed. We need an entirely new body, a la the PRSI, to handle the State Training remit. Many of the old regime need to be “retired”, and new managers recruited from private industry. Budgets need to be managed in an innovate way, so as to avoid the existing model where the annual budget must be spent at all costs. The criteria against which the new organisation’s performance would be judged should be established outside the organisation. Fas has been allowed to set its own targets, and then congratulate itself for superb achievement, year on year. And all expenditure by or on behalf of executives and directors should be published on the organisation’s website. The Sunday Independent of 27th September carried a half-page advertisement on behalf of irelandforeurope, exhorting the reader to Put Ireland First, by voting yes in the upcoming Lisbon referendum. It is a wonderful lesson in how not to do what it purports to do. Firstly, the Yes side can not claim to have a monopoly on putting Ireland first. To suggest otherwise is to offend people who have an open mind, or who have already decided to vote No. The advertisement does not contain even one attempt at persuasive argument, and is basically a load of emotive pap. It asserts: Our children deserve to grow up in an Ireland of opportunity, equality and fair play. Given the length of time Ireland has been in Europe, and the failure to achieve these admirable objectives thus far, this seems to me to be an argument for voting No. Which Sinn Fein are we talking to today? Sinn Fein posters attack Lisbon over “lower wages.” And yet’s here’s a page from Invest NI, a state agency supported by the Sinn Fein/DUP government, bragging about low wages in the North. And EU membership, of course. Hmmm. That partitionism is a terrible thing. The now (in)famous Coir question mark. An excellent post on Maman Poulet about Coir’s targetting of people with disabilities here. A little bit of fiction: Sharp turn on the Rock Road. June 6th 1944: The 1st Irish Free State Division wades ashore on Omaha beach with US forces. It is October 1943, and following a car accident, Eamonn De Valera is dead. Ireland’s young new Taoiseach, Sean Lemass, meets with the US ambassador and makes a decision that will transform the nation’s destiny. You can read “Sharp turn on the Rock Road” here. Sinn Fein and Defence Spending: Eskimos complaining about paying for the fire brigade. A big tank: Bet the Shinners would have liked a few of them in 1969. Looking at Sinn Fein’s posters (You know, the one with the big tank!) gets me thinking once again about Sinn Fein’s mindset. I’ve heard Mary Lou ask, in a debate, as to whether we wanted our “Tax Euros” to be spent on weapons or health and education services. On the face of it, it’s a no-brainer. 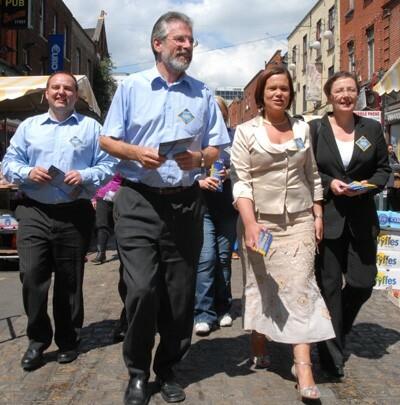 But what I’d like to ask Mary Lou is this: What’s Sinn Fein’s policy on the defence of Estonia? I presume they haven’t got one, and in fairness, no Irish party has one. But the Estonians do. They’ve had Russian tanks on their streets in the last 20 years, and take it seriously. That’s why they got into NATO as soon as they could, and support European defence cooperation and the European Defence Agency because they feel that they are the best guarantee of their freedom as a small country from a domineering large and agressive neighbour. But by Mary Lou’s standards, they’re mad. Sinn Fein’s approach to European defence is like an Eskimo wandering off a passing ice floe into Dublin city, seeing a fire station, and chastising Dubliners for wasting money on these fancy red machines, because he’s never seen an igloo go on fire, and so can’t comprehend why anyone would need such a thing. Maybe if the Estonians got the Russians to wear tee-shirts with “B Specials” on them they would get the idea? As for being forced to increase defence spending, yes, there is a committment by member states to improve their defence capabilities, but it is up to the member states to decide what that means. Look at the British debate about the Trident nuclear missile. Why hasn’t the EU intervened? Because it’s none of their business. The Lisbon Treaty is very detailed: If there is Brussels control of defence spending, why aren’t the actual details in it? Could it be because it doesn’t exist? Sometimes, the People are wrong. It is hard to imagine it now, but in 1972, before he was shot and nearly killed, Alabama Governor George C. Wallace, who had pledged “Segregation, today, segregation tomorrow, segregation forever!” and physically blocked federal troops from escorting black students into colleges, was winning primaries even in northern states, and had a serious shot at the Democratic nomination. 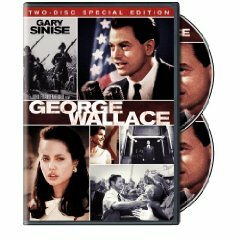 John Frankenheimer’s “George Wallace” stars Gary Sinise as Wallace and a young Angelina Jolie as his second wife. What’s interesting about the movie is how it portrays Wallace as a man who started his political career as quite liberal and tolerant, but saw huge opportunities in playing the race card. The fact is, in Alabama in the 1960s, 70s and indeed afterwards racism was the popular will of the majority of the white people in the state. Wallace railed against a liberal “elite” coming down and undemocratically forcing racial equality on the majority. Sometimes, the elite is right. Interesting aside: In the 2008 presidential election, Barack Obama got less than 10% of the white vote in Alabama. Some things don’t change. You may have noticed some Yes posters from a group calling itself “The Liberals”. I was curious myself, so made inquiries, and got the following reply. You can email them here. Personally, I think the country could do with a liberal party, but here’s where the fighting starts. Put two Irish liberals together, and they’ll agree on gay rights and how awful Youth Defence are and what a good thing the EU is. But get them talking economics and taxes, and that’s where the snots will start flying. Are the Liberals going to be just another version of the Labour Party or TASC? In terms of providing an alternative viewpoint, the country needs a grouping that will put the private sector worker first, in the same way that FF/FG/Labour have put public sector workers first. Oh sure, they’ll contest that, but the facts speak for themselves. Public sector workers are better paid, and have better terms and conditions because private sector workers subsidise them, and there is no political grouping in the country saying that. On the continent, liberals tend to be socially liberal but economically conservative, from the Dutch VVD to the German FDP to the Danish Venstre party. They win anything from 10% to 20% of the vote, speaking up for middle class people who work for a living and generate wealth. Don’t we have people like that in Ireland who deserve a voice? The best Lisbon Treaty information out there. The European Movement, which is taking a neutral stance in the referendum, has published a serious of factsheets on aspects of the treaty and frequently and not-so-frequently asked questions about the treaty. The fact sheets are quite possibly the most accessible yet meaty guides to the treaty I’ve come across, and well worth a look here.